Racial bias and discrimination are extremely prevalent in modern society. Although some people try to deny the fact that race is a determinant of human interactions, this concept is so deeply ingrained into our population that it has inevitably come to be the source of various conflicts. Walter Gilliam, director of the Edward Zigler Center in Child Development and Social Policy at Yale University, conducted a study that proved the undeniable impact of racial bias that emerges for children as early as the preschool level. Through this study, Gilliam sought to demonstrate the idea that race plays an obvious role in determining the predicted behavior of a child. Over 130 preschool teachers and administrators who participated in this experiment were told that they were aiding in a study pertaining to how challenging behavior is dealt with in a classroom setting. The participants were told that they would be viewing videos with some challenging behavior, although this was untrue and all of the videos contained actors. The researchers utilized eye-tracking devices and determined that the teachers spent more time watching the African American children, especially boys. This evidence obviously showed that these teachers had a presumption that the African American children would be the most problematic, so their attention tended to gravitate towards this particular group of students. In a typical classroom setting, the teachers would be more likely to encounter challenging behavior from this specific group because their focus would mainly concentrate on the African American students due to their misguided assumptions. Another exercise involved the reading of a vignette about a young student with behavioral issues. Some of the teachers were told stereotypical white names, while others were told stereotypical African American names. As well, information was provided about the level of instability within the homes of the children. 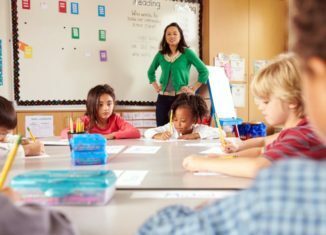 When the researchers questioned how the participants would rate the child’s behavior, it was found that white teachers were more forgiving towards the students that they assumed were African American than than the African American teachers were. This statistic implied that these specific white teachers held the African American students to a lower standard than the white students, solely because of their race. Unfortunately, if this idea is prevalent in many preschool settings, it can be detrimental to the future of many children because many young people choose their goals based on the expectations that society provides for them. Although these conclusions most definitely cannot be held to represent all preschool teachers, they clearly demonstrate a trend within our society. The reason that racial bias continues to exist is because all individuals, whether they are aware of it or not, are inclined to differentiate between people of different races solely because of how our society functions. According to Gilliam, the most effective way for this trend to be discontinued is for teachers to be given a better understanding of the inevitable bias that is obviously prominent in the school system. As more awareness is spread on this situation, people will be more likely to prevent their unsupported assumptions from affecting their perspectives of children.